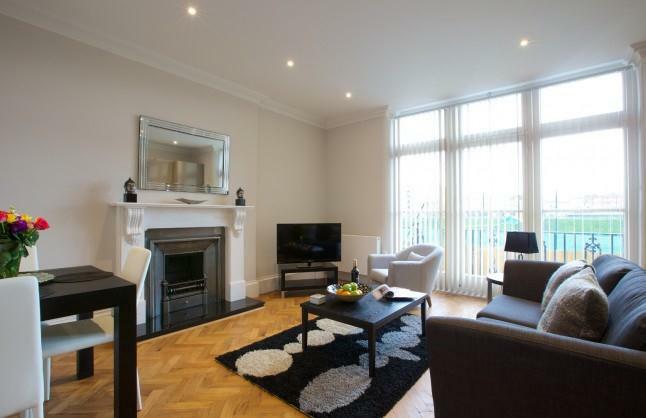 One and Two Bedroom Apartments minutes away from the famous Queen's Club. Barons Court Queen’s Club Apartments are around a 3 minute walk from Barons Court Underground Station. 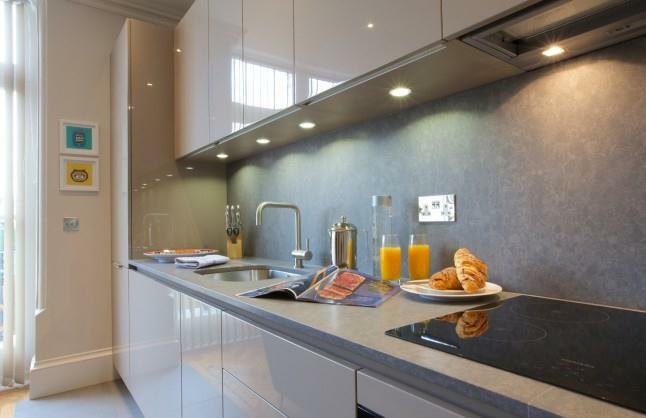 All apartments are equipped with a high standard fixtures and fittings; including a kitchen/breakfast room with integrated appliances, complimentary wireless internet, well-proportioned bedrooms and modern bathrooms. 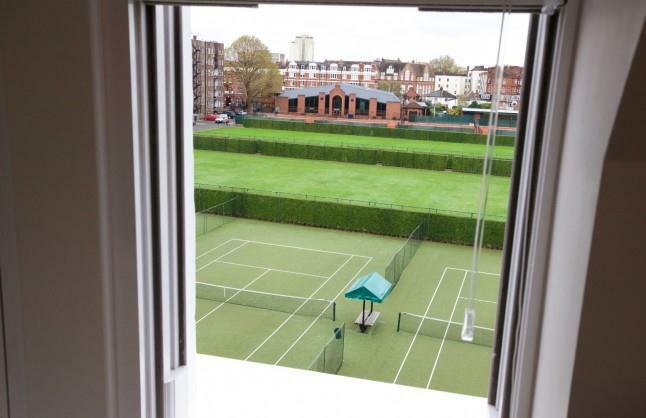 Some apartments offer views overlooking The Queens Club Tennis Courts. The images are representative of a typical unit in the development. Soft furnishings, layout and décor may vary. Check In/Check Out: Check In is available from 16:00pm. Check Out is at 10:00am. Check In Procedure/Keys Collection: This property operates a meet and greet and self check in procedure, advised upon booking. Pets Policy: No Pets Allowed. Child Friendly Facilities: Baby Cots and High Chairs are available on request for an additional one off charge of £50. Extra Bed Facilities: Extra Beds are available on request for an additional cost of £10 + VAT Per Night. The One Bedroom Deluxe Apartments offer spacious living throughout the living room, fully fitted kitchen and dining area, separate bedroom, and modern bathroom. 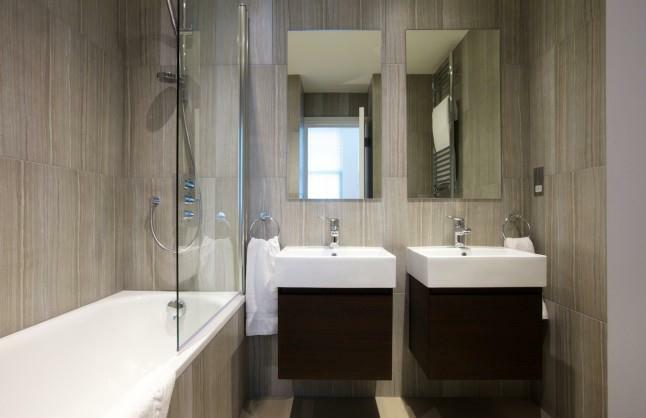 Complete with complimentary Wi-Fi without and a range of modern appliances. 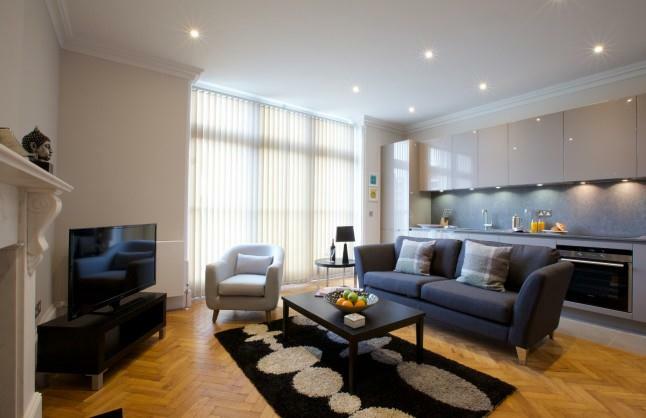 The Two Bedroom Apartments at Barons Court Queen's Club contain: a spacious living area, two separate double sized bedrooms, one bathroom, and a fully fitted kitchen - complete with all modern appliances. Complimentary Wi-Fi and Flat Screen TV's with ample channels come as a standard. The One Bedroom Superior Apartments offer spacious living throughout the living room, fully fitted kitchen and dining area, separate bedroom, and modern bathroom. 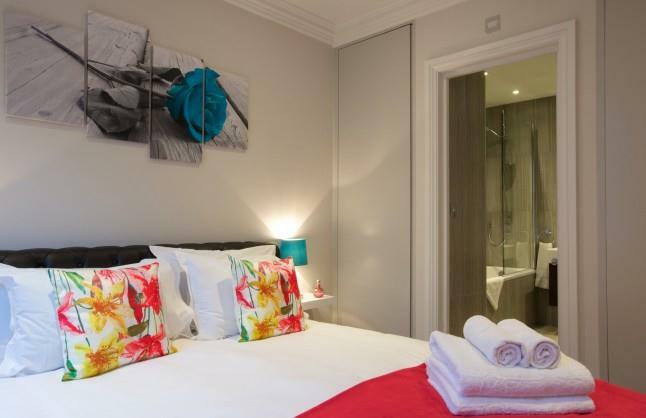 Complete with complimentary Wi-Fi without and a range of modern appliances. In comparison to the One Bedroom Deluxe Apartments, these apartments offer additional space and comfort. The Client must provide the Operator with sufficient information to conclude a Booking. The Operator reserves the right to reject any Booking. Any special requests relating to the hire of the Apartment should be notified prior to booking. The Operator will use reasonable endeavours to accommodate any special requests and such requests may incur Additional Charges. Bookings for groups or peak periods may be subject to additional terms and conditions and will be confirmed at the time of enquiry. The Operator reserves the right to instigate additional/amended terms for any booking, which shall supersede those referenced herein. Any such Special Terms will be confirmed in writing by the Operator to the Client. Payment of the full Agreed Price is due no less than 14 days’ prior to the Arrival Date, unless otherwise agreed. Where no payment is received, the Operator reserves the right to cancel the booking without further notice to the Client. Re-booking after such cancellation/non-payment may result in the booking being subject to new terms and conditions. Should the Client default on any payment agreed, the Operator may terminate this Agreement immediately upon notice to the Client. Where the Client pays via credit or debit card or via international bank transfer, a surcharge will be added to the Agreed Price which the Client will be responsible for paying. The amount of the surcharge will be specified in the Booking. The Operator may also accept payments via bank transfer. For bank transfer payments, the Client will cover any transfer charges levied by the sending or receiving bank to ensure the rent due is received by the Client in full. The Client reserves the right to charge and administration fee of £25+VAT to recoup any shortage of funds due to an under-transfer being made by the Client. Unless otherwise agreed in writing, for every full or part day the Apartment has not been returned beyond the agreed date of return, the Operator may charge a full day’s hire at current hire rates for each part or full day the Apartment is not returned. Payment of any such charge shall be made upon demand and the Client authorises the Operator to take such further charges from any credit or debit card used to make the Booking or the Client will pay by another means. The Client shall pay on demand default interest charges (both before and after any judgment) on any sum payable by the Client to the Operator under this Agreement and not received by the due date at the annual rate of 5 per cent above the Bank of England base rate in force at the time calculated on a daily basis and compounded on a monthly basis from the due date for payment until payment is received by the Operator in cleared funds. Any Booking cancellations must be notified by the Client to the Operator by email. Where the Client gives notice of cancellation at least 14 days’ prior to the commencement of the Hire Period, no cancellation charge shall apply. Where the Client gives less than 14 days’ notice of cancellation, the Operator may charge a cancellation fee equivalent to the Agreed Price or 14 days rental, whichever is the lower. Where the nominated Guest fails to arrive to the Apartment as agreed the Operator can charge a cancellation fee in line with Clause 5. Rebooking of an Apartment following cancellation is subject to availability and any waitlist. The rate previously offered is not guaranteed. Any reduction of Booking duration must be notified by the Client to the Operator by email. Bookings originally confirmed at 28 days duration or less may be amended with 14 days notice. Where the Client gives less than 14 days’ notice of duration reduction, the Operator may charge and the Client/Guest will be liable for a minimum cancellation fee equivalent to the Agreed Price or 14 days rental, whichever is the lower. Bookings originally confirmed at more than 28 days duration may be amended with 28 days notice. Where the Client gives less than 28 days’ notice of duration reduction, the Operator may charge and the Client/Guest will be liable for a minimum cancellation fee equivalent to the Agreed Price or 28 days rental, whichever is the lower. For any reduction of a booking that takes the booking into a higher rate tier due to the shorter duration, the nightly rate for the consumed period will be adjusted to reflect the higher rate and will payment shall be due immediately. Rebooking of an Apartment following cancellation is subject to availability and any waitlist. The rate previously offered is not guaranteed. Guests may check-in from 4pm onwards on the first day of the Hire Period, unless otherwise agreed with the Operator. Guests must check-out by 10am on the last day of the Hire Period. Failure to do so may result in Additional Charges. Earlier check-in or later check-out is subject to availability and may incur Additional Charges. The Operator will provide the Client and/or Guest with specific instructions relating to check-in (including key collection) prior to the commencement of the Hire Period for the Meet & Greet service; and check-out instructions (including key return) upon the Guest’s arrival at the Apartment or during their stay, as appropriate to the booking. It is the responsibility of the Client to provide the Operator with arrival details at least 7 working days ahead of the scheduled arrival date, in order to facilitate a Meet & Greet service. The Operator cannot be held responsible for any delays to the Guest gaining access to the reserved Apartment if arrival details have not been provided. The Meet & Greet service is provided free of charge for arrivals scheduled between 8am and 10pm. For arrivals pre-scheduled outside of these hours the Operator will charge £35+VAT. This fee is waived if the Guest’s arrival airport transfer is booked via the Operator. A self-service check-in can be arranged for arrivals between 10pm and 8am or if the Client/Guest is unsure of an arrival time. Key arrangements or a lock code will be given to allow access. The Client is requested to ensure that its Guest inspects the Apartment immediately upon arrival, either with or without a representative of the Operator. Unless the Operator receives notification otherwise within 24 hours of arrival, the Operator will be entitled to assume that the Client and Guest have fully accepted that the condition of the Apartment is as expected and booked and suitable for the purpose of the intended booking and the Client and/or the Guest will waive any right to claim otherwise. A registration form will be required to be completed by the Guest on arrival. This will be presented at the Meet & Greet service by the Operator where scheduled, or left in the apartment for completion by the Guest within 24 hours of arrival. Risk of damage to the Apartment and Furniture and Appliances will pass to the Guest on arrival and shall remain with the Guest until the Hire Period has expired or the Apartment is returned to the Operator in accordance with the terms of this Agreement. The Client and/or the Guest shall make good to the Operator all loss or damage whatsoever of or to the Apartment occurring during or arising from the Hire Period and all reasonable loss of rental resulting from such loss or damage. However the Client and/or Guest shall not be liable for loss or damage deemed to have been caused by fair wear and tear. A security deposit to cover the Client/Guest obligations may be taken at or prior to arrival. This may be in the form of a payment or an authorisation to deduct payment from a debit/credit card. Any security deposit paid will be returned in full (or payment authorisation cancelled) upon the Apartment being returned to the Operator in accordance with the terms of this Agreement. Where the Client is liable for loss or damage the Operator may withhold some or all of the deposit to cover loss and damage and administration fees associated with repairing the Apartment (refer to Additional Charges for details of such administration fees). The Operator will make regular checks of the Apartment during the booking and if any damage beyond wear and tear is observed, the Guest and/or Client will be contacted with the details of the damage and the Guest may be held liable for the costs of repair/replacement. Should the Client wish to extend the Hire Period a request must be submitted to the Operator and the Operator may at its discretion and subject to availability, grant such request. Extension is not guaranteed and is subject to availability and payment by the Client. The Client authorises the Operator to take all additional payments from the credit or debit card used to make the Booking. If no credit or debit card was used in the Booking the Client must pay by another acceptable means. Payment of any agreed extension will be due on or before the commencement of the new extended period. Extensions to existing bookings are done so at the rate already secured unless extending by the minimum required period to qualify for the next rate duration tier. Where the apartment specified in the Booking becomes unavailable prior to the commencement of the Hire Period, The Operator reserves the right to relocate the Guest to an apartment of similar type and standard in a similar location. Where such alternative apartment is priced lower than the apartment specified in the Booking, the Agreed Price shall be reduced accordingly. Where such alternative apartment is priced higher, the Agreed Price shall remain the same. In rare circumstances where the Operator has been served notice to vacate a building or apartment by its Landlord, the Operator will provide the Client and Guest a minimum of 30 days notice and offer to move the Guest to an alternative location at the same rate or offer a refund for the vacated period.